In our efforts to go fully digital while also providing the most informative, up-to-date tourist information, our team has started making the first bilingual maps of each individual village at Indawgyi Lake. 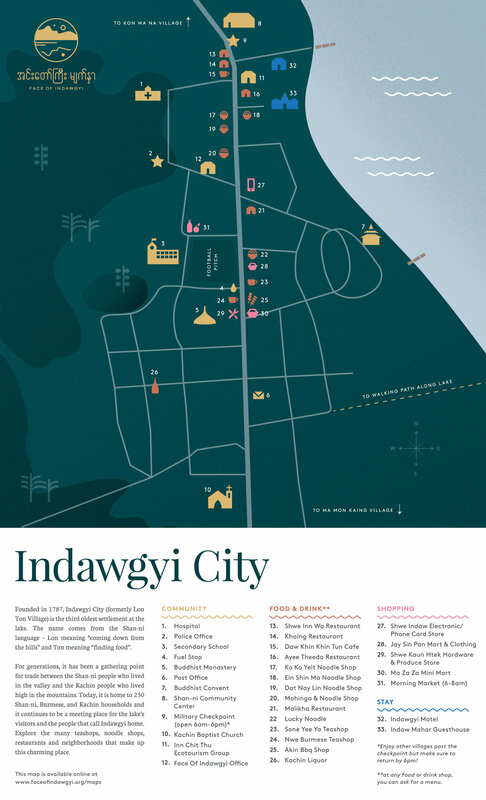 We have spent over a year learning the village histories and compiling GPS points of all the exciting destinations and important landmarks, and our home Indawgyi City (formerly Lon Ton Village) map is the first of many to come. In the next six months, we will also combine all of these maps into a user-friendly, real time phone app that visitors can use to explore the every-changing landscape and current events happening around Indawgyi. Feel free to save and share the images below! Furthermore, as of January 2019, the first-ever bilingual map (pictured below) in English and the local Shan-ni language is complete! Very special thanks to all the Shan-ni elders in each village who helped us with the correct spelling in Shan-ni script and with learning the history of their home - sometimes for the first time. For each village, we include the original Shan-ni name and an image illustrating what the name means so locals and visitors can begin to learn their unique histories.